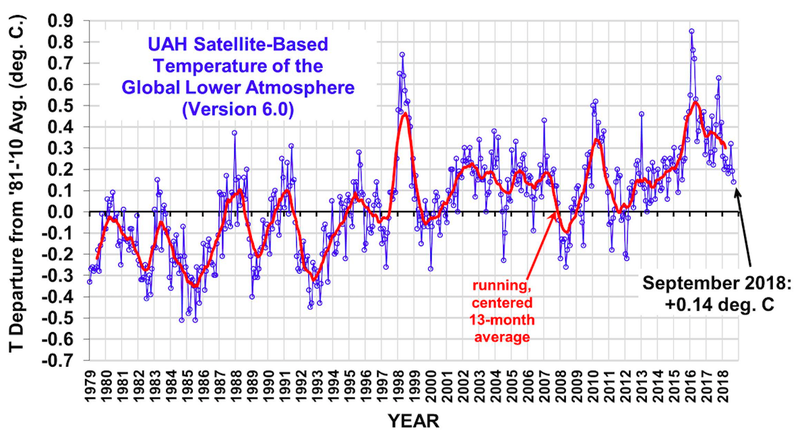 According to the latest UAH satellite measurements, global average lower tropospheric temperature has dropped to levels that has made September the coolest in 10 years. In reality, the opposite has happened: global temperatures have been falling sharply since 2016 while the 21st century warming trend is half of what most climate models predicted predicted, slowing rapidly. 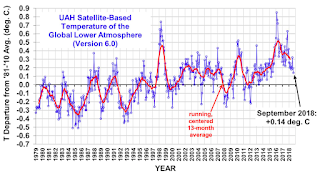 The question is whether or not global average temperature remains at current levels in coming years, i.e. levels we have seen for most of the 21st century, with the exception of two short-lived El Nino events (in 2009/10 and 2015/16). Time will tell. 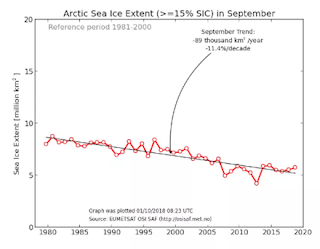 The Danish Meteorological Institute (DMI) confirm that the average Arctic sea ice extent during September was the fourth highest since 2006, and the greatest since 2014. It is of course far too short a period to pretend to identify any real trends, but it is clear that the short period of decline before 2007 has now finished. In addition, most of the ice is two meters or more thick, in stark contrast to ten years ago. Hundreds of diplomats from around the world are set to scrutinize the IPCC’s latest Summary for Policy Makers, which contains predictions and benchmarks findings on staving off a climate catastrophe by 2040. PARIS, France – The world’s nations will gather at a United Nations conference in South Korea on Monday, October 1 to review and approve a 20-page bombshell – distilled from more than 6,000 scientific studies – laying out narrowing options for staving off climate catastrophe. Of hundreds of climate models in 2015 projecting a low-carbon future, only two or 3 aimed for a 1.5C global warming cap. The 20-page which will be collectively scrutinized, line-by-line, by hundreds of diplomats through Friday, October 5 – contains several benchmark findings, according to a draft obtained by AFP. To have a fighting chance of staying under the 1.5C cap, the global economy must, by 2050, become “carbon neutral,” meaning no additional CO2 can be allowed to leach into the atmosphere. In addition, the report suggests that carbon dioxide emissions from human activity will need to peak in 2020 and curve sharply downward from there. So far, we are still moving in the wrong direction: after remaining stable for 3 years – raising hopes the peak had come (sic) – emissions rose in 2017 to historic levels. For many scientists, these targets are technically feasible but politically or socially unrealistic, along with the broader 1.5C goal. PORTSMOUTH -- The upcoming Portsmouth Conference is offering scholarships for the cost of admission for 30 graduate students, underwritten by Gabelli Funds/Mario Gabelli. Founded in 1976 by Mario J. Gabelli, Gabelli Funds is a diversified global financial services company, which has supported many educational programs. The grant provides support for the attendance of graduate students in economics, business management or public policy from colleges and universities in northern New England. The Portsmouth Conference will take place Oct. 18-19 at the Wentworth by the Sea Hotel & Spa in New Castle. In bringing together experts from across the world to discuss policies that relate to climate, including their consequences, the Portsmouth Conference will provide unique opportunities to explore improved public policy and investment strategies, including guidance on economic, regulatory and societal levels. Ten leading international thinkers will speak and share ideas at the conference hosted by Citizens Count, a non-partisan public information platform with more than 200,000 members. The conference will be moderated by Kevin Fay, Esq., of Alcalde & Fay. Fay, executive director of the Alliance for Responsible Atmospheric Policy as well as the Business Institute for Sustainability, is a well-known businessman, community leader and advisor to Fortune 100 industries. Speakers at the conference will include Archbishop Bernardito Auza, permanent observer of the Holy See to the United Nations; Dr. Bjorn Lomborg, president of the Copenhagen Consensus Center and visiting professor at Copenhagen Business School; Charles D. McConnell, executive director of Rice University’s Energy and Environment Initiative; Mikko Paunio, MD, adjunct professor in general epidemiology, University of Helsinki; Dr. Benny Peiser, director of the Global Warming Policy Foundation; Florence Reed, founder of Sustainable Harvest International and partner of Regeneration International; Joyashree Roy, Bangabandhu chair professor, Asian Institute of Technology; Economics, Jadavpur University and ICSSR national fellow; Rob Threlkeld, global manager of renewable energy for General Motors; and Fritz Vahrenholt, chairman of the German Wildlife Trust. Gabelli Funds/Mario Gabelli joins other sponsors such as Robert Day, Two International Group, the Schleyer Foundation, Optima Bank, Lyons Law, Delta Dental, CP Management, DTC Lawyers, Toyota of Portsmouth, the Labrie Family Foundation and others in support of the international gathering. To apply for a scholarship to the conference, graduate students must submit an application at www.theportsmouthconference.org by Oct. 15. Scholarship recipients will be notified by Oct. 16. Germany’s Federal Audit Office has accused the federal government of having largely failed to manage the transformation of Germany’s energy systems. According to Federal Audit Office data, the Energiewende has cost around 34 billion euros in 2017 alone. In addition to the federal government’s expenditure of almost 8 billion euros, this also includes the burdens on end consumers, in particular due to the renewable energy levy (EEG). The wastage of resources to implement the Energiewende was “unprecedented”. Last year, the federal ministries and subordinate authorities employed around 675 full-time staff, 300 of them in the Federal Ministry of Economics alone, divided into 34 departments and four divisions. In addition, there are at least 45 committees at federal-state level dealing with the green energy transition. The effort being expended here is in itself almost contradictory to one of the main objectives of the energy system transformation: the economical and efficient use of scarce resources. “The scope of the legislation is also striking,” Scheller stated: “At national level alone, 26 laws and 33 regulations regulate the generation, storage, transmission, distribution and consumption of energy. There is, however, “no place where everything comes together, no place that assumes overall responsibility”, Scheller criticised. In short: “A lot of effort does not necessarily mean a lot”. For despite a great frenzy of data collection there is no overall view. “The Federal Ministry of Economics uses 48 different data sources to check the status of the Energiewende on the basis of 72 indicators, and yet “there is a lack of meaningful data that could be relevant for assessment and control”. Many data would have little control value or would be available too late, but often they would “simply draw the wrong conclusions”. For example, there are “no quantified targets, no measurable indicators” for the energy policy goals of affordability and security of supply, Scheller criticised: “Here we are poking around in the dark.” For five years now, the Federal Ministry of Economics and Technology has been responsible for the green energy transition, but the ministry is “in no position to determine what it must do to ensure that the goals of the Energiewende are demonstrably and economically achieved”. Instead of the impenetrable jungle of subsidies and rampant laws, CO2 pricing would be a simple and transparent alternative that has long been demanded by expert commissions of the Federal Government. For better coordination of the Energiewende, a staff unit at the level of state secretary, an interministerial committee and a federal-state committee would be conceivable. The federal government rejected the assessment. The Federal Ministry of Economics and Energy, headed by Peter Altmaier (CDU), responded in a rather surprising way: “The government considers the Energiewende to be “effectively and efficiently coordinated” and sees “no need for action”. However, the ministry did not address the fact that the Energiewende has largely missed its targets. Astonishingly, the Federal Ministry of Economics also stated that the multi-billion levy under the Renewable Energy Sources Act (EEG) should not be counted as a costs of the green energy transition. Until now the EEG levy for subsidising renewable energy was always considered as the actual pillar of the Energiewende. 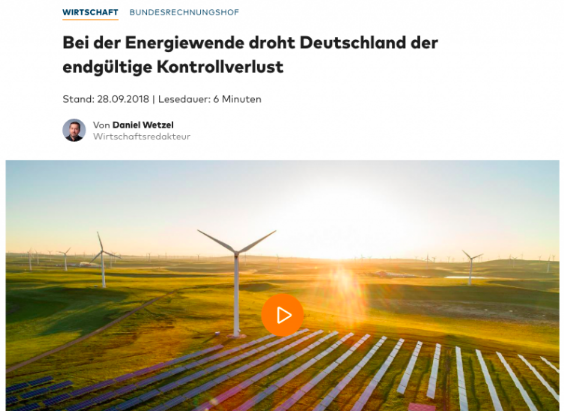 According to the government, even the billions of euros in relief payments for the German industry to compensate for higher energy costs are “measures of industrial policy and not Energiewende measures, which thus cannot be attributed to the Energiewende”. The Federal Audit Office, however, does not consider these replies to be tenable. “It is conspicuous that the Federal Ministry of Economics and Technology has not commented on the missed targets some of which are quite considerable,” the Federal Audit Office states. It is also “incomprehensible that the ministry does not include the renewable energy levy (EEG) among the costs of the Energiewende”. A “counterfactual scenario” is also unnecessary in order to evaluate the overall costs. After all, it is “not important what expenses and costs would hypothetically have arisen even without a green energy transition in order to offset these against the actual costs incurred”, the Audit Office says: “The possibility of ‘renouncing the Energiewende’ associated with a counterfactual scenario no longer exists in reality”. Scheller said it was “regrettable” that Germany had lost its self-propagated international pioneering role: “Germany had made a strong start and is now doing comparatively poorly internationally.” The President of the Court of Audit referred to the ranking of the World Economic Forum: According to the ranking, Germany is no longer represented on the list of the ten most successful energy transition countries in Europe. Internationally, Germany occupies only the 16th place. China shifts focus from air quality to boosting growth as trade war bites. Beijing will not renew significant cuts on steel production and coal use aimed at improving air quality this winter, as policymakers look to boost China’s economic performance in the midst of the country’s trade war with the US. The curbs — a rare restriction imposed on industries where state enterprises are prevalent — were meant to target airborne pollution, which worsens during the winter as much of the country’s northern cities are heated with coal-fired power. Last year, steel producers in four major production cities were forced to halve their output during the winter months while reducing their use of coking coal by nearly a third. Twenty-eight cities and regions were mandated to cut steel and aluminium output by roughly the same amount. This winter, regulators are replacing hard caps on coal use and steel production with less stringent targets, weakening draft guidelines put out in August.